Hey guys, I've got a fun surprise for you today! Marlen is doing a series of post swaps about transitioning summer clothes into fall and I'm honored to be one of the lucky few she asked to participate. 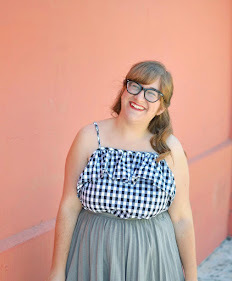 Not only does Marlen have the best print and color combinations (sometimes I don't even know how she manages to make the most unexpected items work flawlessly together), but she also shares my love adding sarcasm and humor to a fashion blog. To see my summer to fall look and more of Marlen (you know you want to), head on over to Messages on a Napkin! Hello all, My name is Marlen (like the Monroe and not the fish) and I blog over at Messages on Napkin. Seeing how October is quickly coming to a close and taking its toastiness with it, and the biting months are waiting right around the corner, Elana and I thought it would be fun to show you how we move our summer pieces into fall. I know hard it is to put away those florals and happy colors, so who says you need to say goodbye before you're ready? Here I have one of my go-to sparrow patterned blouses and my best flowing-in-the-summer-breeze skirt. They both have deep colors, so when paired together they give off an Autumn vibe. Then I shimmied into some plum colored tights and threw on a chunky cardigan to keep warm and snuggle into. I added a brown hat to bring out the burnt orange and brown colors in the look, and voila! You're ready to watch It's the Great Pumpkin, Charlie Brown while forcing your little brother to make you a mug of hot coco. Or is that just me? love that green skirt so much! so sweet of you to share another blogger's post! her style is cute indeed. Love the burnt orange and green together, Marlen! And elana, I love your style! 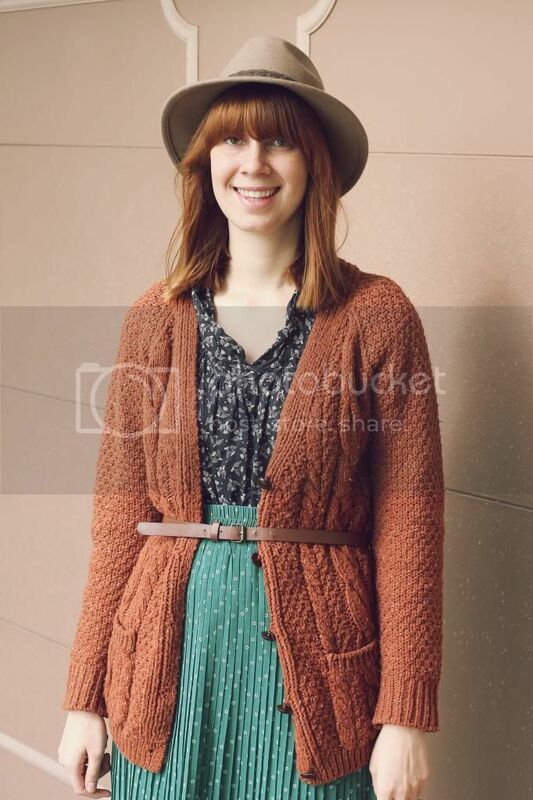 I am loving the colabs!That is the best fall sweater ever, definitely need to try my hand at the belt over the sweater look too! I do have to admit, I was slightly confused in my reader though at who/what/where this was posting from! Marlen you look darling! 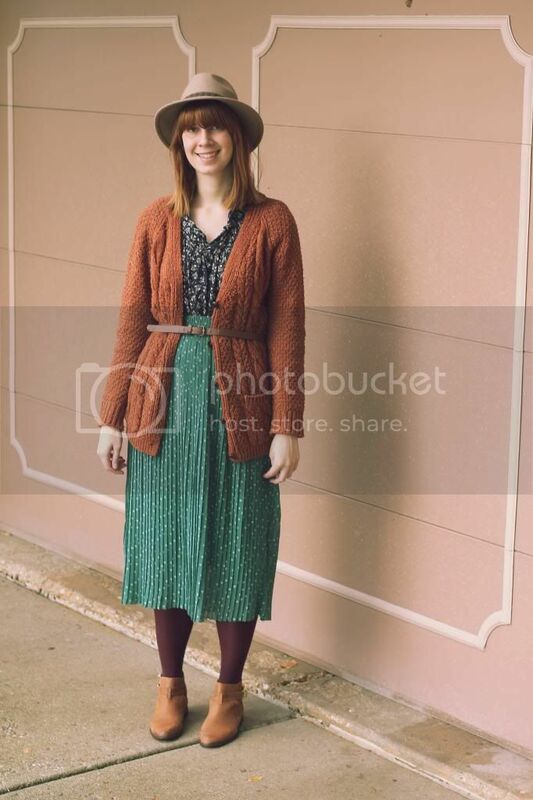 I absolutely love this sweater and your skirt is amazing! I love the color. Oh, and that hat! Just everything basically. Hi Elana! I'm so glad Marlen introduced us to your blog:)! I'm following you now on GFC! Marlen, I love your skirt:))! You look adorable! Hi Marlen! 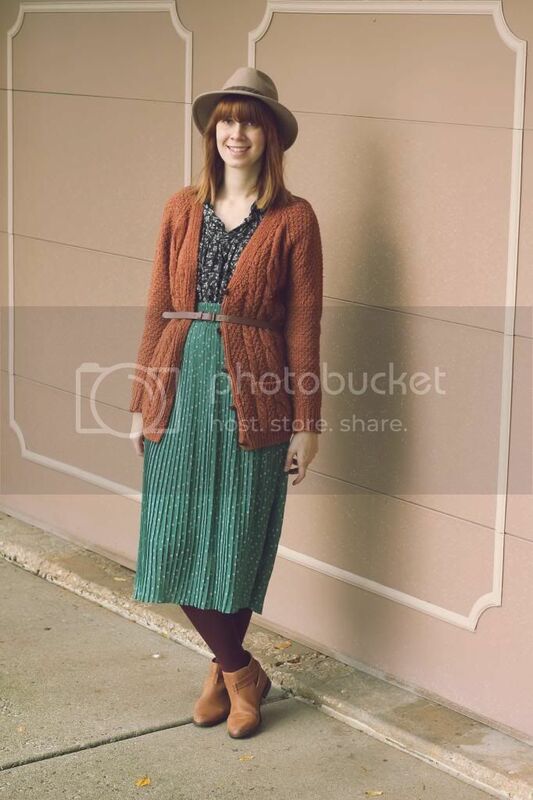 I love that chunky sweater and the pleated skirt is absolutely gorgoues :) And the purple tights are awesome. I have one and I never know what to wear with it! Love that you're guest blogging! Was just over at your page and saw Elana posting there! Love your piece, as usual, you always have such a unique and authentic style!